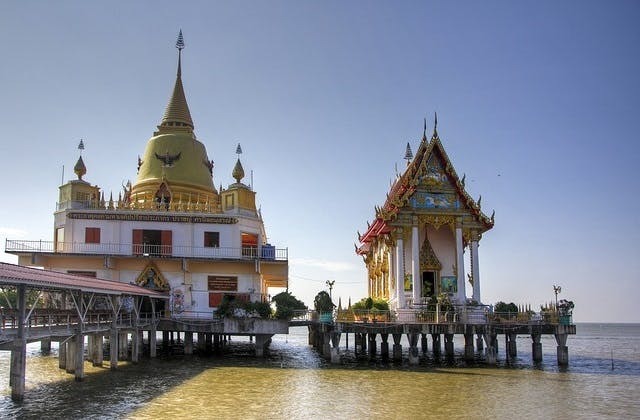 Bangkok is the capital of Thailand and also its largest city with a population of around 12 million. Because of its geographical location, it became a major center for politics and trade starting around 200 years ago. Today Bangkok is one the largest, wealthiest and most influential cities in Asia especially in south East Asia. Despite its large population and wealth, the city is considered to be among the safest in Asia. One of the main reasons for the cities economic boom is because of the influx in investment by multi national corporations in the early 80's. Not only in population size but also going by its land mass Bangkok is one of the largest cities in the world. The UTC/GMT adjustment for Bangkok is 25200. BKK is the International Air Transport Association (IATA) airport code for Bangkok. The cheapest flight from Adelaide to Bangkok is $322 on Jetstar. The longest flight to Bangkok is from Auckland , going through Bangkok, Istanbul, Venezia (Venice), Kuala Lumpur.